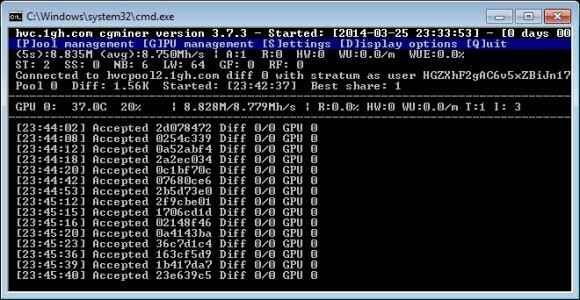 AMD GPU owners mining for Heavycoin (HVC) can finally be happy with the latest performance optimization of the cgminer with HVC support as it takes back the lead in terms of performance from the Nvidia GPU miners. The new update adds almost 4 more MHS of performance on a Radeon R9 280x GPU with us getting about 12.8 MHS with the previous update and now with the new one we are up to about 16.2 MHS with the same hardware and settings. The new updated version that you can download from the link below for windows (source) includes the performance update and we recommend you to update now in order to benefit from the performance boost. And no, this is not a joke, but actual performance increase for free. Another update to the cgminer 3.7.3 for Heavycoin (HVC) GPU mining on AMD GPUs. The latest OpenCL kernel update brings some extra Megahashes out of the hardware over the previously available release of the miner, even though mining on Nvidia seems to still be ahead in term of performance with the latest ccMiner 0.5. With the new updated version that you can download from the link below for windows (Linux source here). With the new update you can expect to get something like up to 50% more performance, or this is what we are seeing after running our tests on a Radeon R9 280x. We got up to 12.8 MHS on that particular card after getting up to about 8.8 MHS with the previous release. Not bad and if you are mining HVC, then you should most definitely update your miner in order to be able to enjoy the extra performance gain with the new version. 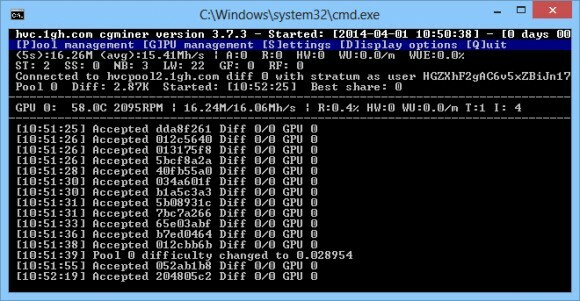 There have been some additional updates in the Heavycoin cgminer GPU miner that bring out extra performance, so if you are currently mining HVS then you better update to the latest release. The results we are getting are with more than 1.5 MHS higher than with the previous version that has also added some performance improvements. With the older release that we have compiled and published here we’ve got around 7.2 MHS from a single Radeon R9 280X GPU and with the latest binary we are getting up to about 8.8 MHS with the same hardware (1000 GPU /1500 VRAM), so definitely a very good improvement performance wise. Below you can download the latest cgminer 3.7.3 with support for HVC GPU mining compiled for windows.